During her summer cruise and visit to Nakskov last week, Her Majesty Queen Margrethe visited the old shipyard halls – home to East Metal. This gave the company the perfect opportunity to explain how to breathe new life into the port’s business community. Since 2013, East Metal has spent time transforming the old production halls and getting them to bubble with life once more. East Metal is a subcontractor to the mechanical engineering industry and there are currently three main areas that benefit from the company’s existence and expertise: the wind turbine industry, transport and lifting technology, and mechanical engineering. Her Majesty Queen Margrethe visited the facility and, with a good deal of insight, asked several questions about how this centre came into being. East Metal designed the facility itself, but sought expert advice with regard to load calculation, hydraulics, control, and safety. The centre is now leading the way in its field. 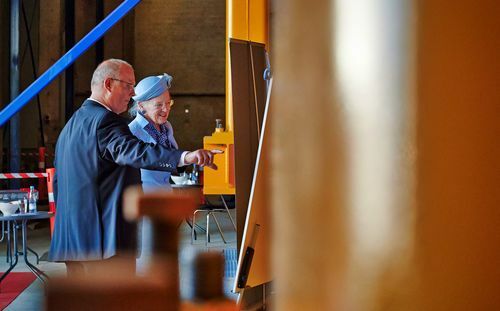 Her Majesty the Queen was also given insight into the extensive project and quality control processes which all products undergo, right from the start of production up to delivery to the customer. The factory in Nakskov was established in 2013 and now has just under 50 employees, including no fewer than 16 apprentices and a further three who have just passed their journeyman exams. The factory works with semi-finished products from East Metal’s three factories in Latvia and so focuses on the completion of the products for Danish and foreign customers. The Group currently employees approximately 800 people.